America Divided is a groundbreaking documentary series that features celebrities such as Common and Norman Lear exploring stories that are meaningful to them personally. 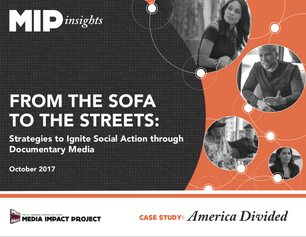 Broadcast on EPIX, the series worked with civic groups to host screenings and promoted discourse that inspired action among viewers nationwide. Our report looks at how groups organized and acted after viewings. How Do We Know…If Wheelbarrows Work? Fictional feature films lend themselves very well to the characteristics of “Wheelbarrows,” usually focusing more on high-octane storytelling than pedantic social messaging. But, even though the social message might not be front and center, fictional films can be incredibly powerful purveyors of factual information, and the best of them offer nuanced treatments of complex human issues. To presume that audiences just turn their brains off while watching fictional entertainment defies decades of social science research demonstrating that media representations have a profound effect on people’s sense of social norms and even their own sense of agency. Audiences are moved by fictional representations and, if the depictions feel realistic and compelling, people often apply what they learn in to their real lives. 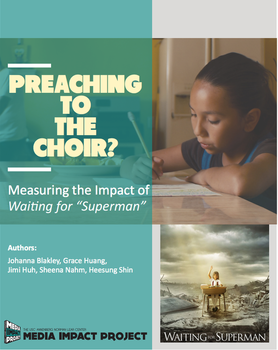 ​At the Norman Lear Center, we have been evaluating the social impact of health storylines in fictional TV shows since 2001,. We had the chance to measure the impact of a fictional feature film, Steven Soderbergh’s science fiction medical thriller, Contagion. 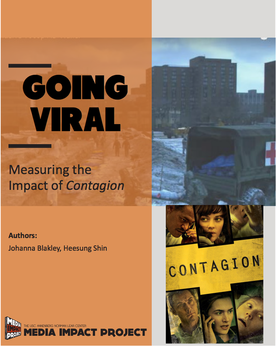 The film, which earned $75 million at the box office, follows the rapid progression of a highly contagious virus that kills within days... for a look at the film and Johanna Blakley's blog on the topic of evaluating the impact of Contagion, visit here Johanna offered a second post in the new “Ask the Evaluators!” series at Active Voice Lab, exploring real-world assessment of recent media projects to help you make informed decisions about what can be measured, and good questions to ask along the way. The Norman Lear Center's Media Impact Project has developed an innovative new survey instrument that answers a question that has long preoccupied media researchers: Can films really change people’s behavior? MIP is proud to announce findings from a series of surveys that measure the impact of a film on viewers’ knowledge, beliefs and behavior. Read the reports below. 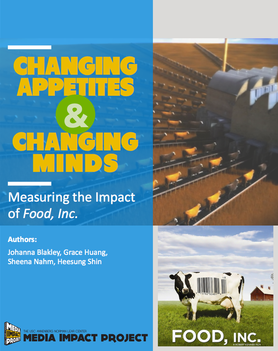 Lear Center Managing Director Johanna Blakley was an advisor on this social action campaign to ignite conversation and spur action around solutions to our nation's hunger and obesity epidemic. Read the study & report. Johanna Blakley also joined entertainment industry professionals at the Seattle International Film Festival to discuss the promise and perils of social impact campaigns around films. Since 2001, the Lear Centers' Hollywood, Health & Society program has been investigating the effects of health topics in entertainment narratives on viewers' knowledge, attitudes and behaviors. Johanna Blakley Presents "Movies for a Change"
In her TEDxPhoenix talk, Johanna Blakley explains the inner workings of a research study conducted by the Norman Lear Center and Participant Media that aimed to figure out if movies have true and lasting impact on viewers. As TV viewership expands across multiple channels, platforms and services, audience researchers are turning to social media services such as Twitter to complement traditional media metrics. In this partnership with the Annenberg Innovation Lab and IBM, we analyze public discourse on Black Twitter.